Steven Wright seems to be afflicted with the tribulations of Job. Well, nobody has it tougher than Job did. But Wright keeps getting knocked out of play just as he is getting in gear. It wasn’t easy for him to get into the MLB to begin with. Patience, persistence and the knuckleball enabled him to do it in 2016, five years after he adopted the knuckleball as his primary pitch. In that first MLB season, he was placed on the disabled list for a shoulder problem in August. He didn’t lose an awful lot of time, and his knuckleball impressed many. In 2017, though, Wright was knocked out after only five appearances on the mound because of knee trouble that required surgery. In 2018, he was suspended because of domestic problems, then lost more weeks because of resurgent trouble with his knee. His team, the Boston Red Sox, went on to win the World Series, but it did so without Wright on the roster. He had more surgery on his knee in November. We don’t know what exactly happened, whether there’s a possibility of a false positive, whether one molecule was detected or a bucket or what. We can only say that we are rooting for Steven Wright. We hope he returns to the game in fine health and continues to impress as a knuckleball pitcher until he retires from the MLB sometime in his mid-40s. Which knuckleballer once threw a shutout to beat Greg Maddux? 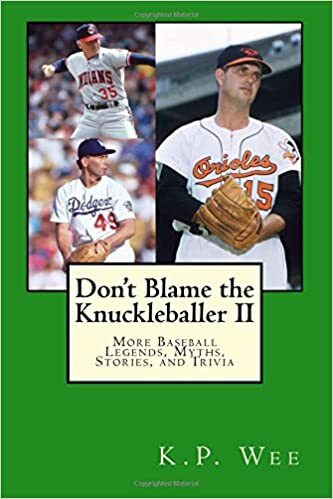 Which knuckleballer was the second pitcher ever in big-league history to have two consecutive starts of eight-plus innings and zero runs to begin his postseason career? Which knuckleballer was said to have had “one of the most courageous pitching performances” of the 1939 major-league season—and why? As for Tom Candiotti, he pitched 16 seasons in the big leagues, and though he finished with a career losing record and “only” 151 victories, he had an ERA over 4.00 only six times. Candiotti nearly won the ERA title in 1991, finishing with a 2.65 earned-run average that was second in the American League only to Roger Clemens (2.62). Had he allowed just one fewer earned run over the course of that season, Candiotti would have won the ERA championship. In 1993, he finished just 8-10, but suffered from atrocious run support while pitching for the Dodgers. That year, he was the ERA leader in the major leagues, pitching to a 2.43 earned-run average entering September before struggling in the season’s final weeks to finish at 3.12. In fact, for a full decade from 1986-1995, Candiotti had a 3.44 ERA, which was one of the best earned-run averages in baseball during that stretch. He also averaged 30 starts and over 200 innings during that decade, proving to be a very dependable pitcher for his clubs. He and Mark Langston were the only pitchers in the majors to work at least 200 innings in each season from 1986-1993, until the 1994 strike ended both streaks. His career ERAs after the 1995 season were 3.51 in the American League and 3.38 in the National League. Of his 151 career wins, 70 came in starts where he allowed one run or none. Even though he threw the knuckleball primarily during his career, he consistently had a 2-to-1 strikeout-to-walk ratio, meaning he consistently had twice as many strikeouts as he did walks…. Tom Candiotti never truly got any recognition because of the losing records he suffered while pitching for bad teams in Cleveland and Los Angeles. Had he gotten better support, he would have been better remembered. Here’s a YouTube video of Candiotti striking out Mariano Duncan. Here’s a YouTube video of an interview with Wee talking about Candiotti. This one sounds like a big change. But really, if a team is using someone like infielder-turned-knuckleballer Alex Blandino in a close game in the seventh inning, there are bigger issues at play. Bigger issues than discovering a hitherto unknown knuckleballer and seeing what he can do while being observed by millions?